Instead of persuading the Communists, Sedgwick was persuaded by them. His first political activities on the left were in defence of the Rosenbergs, and then the campaign for independence for Guiana. Following discussions with Raph Samuel, Sedgwick joined the Communist Party in spring 1954. He became Secretary of the Communist Club, a role he held for a year. He wrote for Oxford Left and Isis, and spoke at meetings of both the Communist and the Labour Club. Sedgwick worked as a psychology demonstrator and then as an educational psychologist in Oxford before in his mid-30s beginning a career as a Lecturer in Politics at the Universities of York and Leeds, as a result of which he moved to Shipley near Bradford. The student beard returned; the fate of the umbrella is unknown. Sedgwick’s name will always be remembered on the left not only for his activism (although that is important) but for the precious evening hours of his best years which he dedicated to translating the Memoirs of Victor Serge. Sedgwick’s role in the IS internal debates of 1968-1971 was to prick the pomposity of anyone claiming the mantle of “Leadership”, whether in the Party or the Class. After one Chris Harman speech in support of Cliff’s Leninist turn, Sedgwick leafleted the IS conference with an account of a Bolshevik historian who had produced Lenin’s Collected Works on perforated paper, allowing any quotation to be produced, no matter how badly torn from its context. Within just a couple of years, the IS had converted itself to the SWP, the split with Higgins had taken place, and Labour’s in power had clamped down on unofficial strikes. Sedgwick acknowledged that Cliff’s wager on history had been misplaced. The 1970s and 1980s were not going to be an “Age of Majorities”, and the task facing the SWP was exactly the one that the IS had just spurned, the accumulation of cadres, with humility and humour and a historian’s sense of patience. Sedgwick’s alternative vision was of consistent demands upon the health services, which would transform and deepen (not negate) the principle of care. One feature of his book which operates as a standing rebuke to the organisational politics of our recent crisis was Sedgwick’s insistence on translating and popularising the ideas of the writers with whom he disagreed most fiercely. If his readers wanted to know the errors of Foucault, he insisted, they should read and judge them for themselves. We are all familiar with the methods of potted summary, selective quotation and manipulation of positions away from what a person has actually said to “the logic of where they are going”. This was never Sedgwick’s approach. Even more than winning it, he was passionate first of all for actually having the argument. Much of the book is revised versions of earlier published academic articles, many from the early 1970s (ie from Sedgwick’s “high” period of activism) in IS. That this wasn’t all his theory of psychiatry is apparent from a paper he presented at the Annual Meeting of the Royal College of Psychiatrist in London in July 1982. The tone of the paper is cautious, very far from Sedgwick’s old approach in which all problems in life could be pushed aside through the sheer motive power of class, humour and logic. Through all his life, Sedgwick wrote in careful, measured tones. He had the patient dignity of an Atticus Finch. There was however a gap between the calmness of Sedgwick’s writing and the torrent of his life (and his speech). Stephen Lukes’s obituary in the New Statesman implies that over time it was the torrent which won, referring to Sedgwick’s “private tragedy, in which his mind became clouded, amid a sense of political collapse and personal isolation.” Sedgwick was found dead in unexplained circumstances in 1983. That notion of service is important. Set against the requirements of the contemporary university system for quantifiable output (“publications”, “research assessment”, “metrics”), Sedgwick’s record of just one book in two decades as a university lecturer would be reckoned a failure. But Sedgwick was never primarily an academic; he was first of all an activist. The tasks he gave his time to – building IS branches, translating Serge, advocating for Cliff’s turns when they were healthy and against when they were not – could by definition have their fruits only in the products of others. In the same way, Michael Kidron’s genius was reflected not merely in the theory of the Permanent Arms Economy, but in the brilliance of the old International Socialism journal, under his stewardship, and his encouragement of its contributors. And Duncan Hallas’ genius was in the confidence his speeches gave to others. Sedgwick shared this focus on collective work; on the group. His departure from IS/SWP was a sign not of his weakening but of how far his comrades had travelled. In his last years Sedgwick had returned to Serge, hoping to find in his first inspiration the explanation for what the left had got wrong and how it might be rescued. Mere fragments of this project survive. One, at least, was published posthumously, an article for History Workshop on Victor Serge, “The Unhappy Elitist”. It is a brave critic who has the courage to admit that their heroes’ mistakes (and by extension their own) were the product of their very dissidence. Dave forgive my repeated comments on your fascinating series on some of the leading personalities of the old IS organisation but all of them were comrades who I worked with and I knew personally very well. “Sedge” – as many of us called him – was a real ‘one off.’ You have brought out his idiosyncratic individualism and fearlessness very well. He was not always 100 per cent right in his judgments. He – and I – were badly mistaken when we were temporarily seduced into advocacy of opposition to British membership of the EU by the illusion that we would in that way increase our influence over militant – but frequently chauvinistic – Labour left and CP workers who were then a powerful force in the Labour movement. Worse still we persuaded Cliff and other IS leaders to follow us – against the warnings of Jim Higgins, Geoff Carlsson and others. I at least feel I have done penance since to make recompense. But Peter was more often spot on – particularly when it came to defence of democracy and intellectual honesty on the far left. You refer to his pioneering work in exposing the hugely dangerous influence of Laing, Cooper and others who advocated a mumbo jumbo school of psychiatry in which the mentally ill were presented as really the only sane ones. Peter – who knew about this world from personal family life as well as professional experience – destroyed that charade and helped restore debate on the left back where it belonged, to campaigning for a decent, free and people oriented NHS. By the way there were not just “a few recruits (to IS) from the New Left.” In the rapidly growing Young Socialist movement after 1959/60 it was not uncommon to find militants who would sell both NLR AND the early IS journal. Many of us were won over – as I mentioned elsewhere – in part by the case made by Kidron and MacIntyre in the New Left debates of that period. I last saw Peter in Brussels – where he was researching the Victor Serge archives – just a few months before his mysterious and utterly tragic death. He was as bright and bubbly as ever – if a little frailer – but more than determined to continue the fight for a democratic and liberating socialism. You missed out my favourite story: at the aggregate following the decision to change the name to the Socialist Workers Party, Peter denounced the decision as mistaken and undemocratic, and insisted that he was not leaving; he would continue to be an International Socialist, and the rest of us were leaving *him*. I don’t now remember if he actually called us ‘splitters’, but that was his logic. We all laughed, but sadly he was entirely serious. It was a loss both for us and for him. Leeds SWP aggregates were never again as much fun without him; but he lost something too. Some people work better outside organisations, but I think that Peter needed something to be dissident *from*. Peter was a most rigorous and often merciless mentor but at times his almost anarchic and always eccentric humour seemed to give way to periods of saddness and uncertainty. Towards the end of my second year he married an Iranian emigre, who probably from her own experience of political persecution introduced a dimension of chaos into an already troubled life. Around the time of his death I had been successfully drumming up students for his ‘Politics of Fascism’ course that I had managed to persuade him to re-run. And although harassed and clearly rather down, the challenge of a re-run of a popular course had greatly enlivened him. News of his sudden death came as a blow to us all and for the first time in my life I discovered the real awfulness of hopeless grief. I felt terrible having declined that last pint over which a few more words might have made a difference. Peter left a gaping hole where comradely mischief had never been tainted with sarcasm. But maybe it was that missing opportunity to engage in dissent that permitted a darker side of the spectrum into his otherwise optimistic and quite joyful outlook. 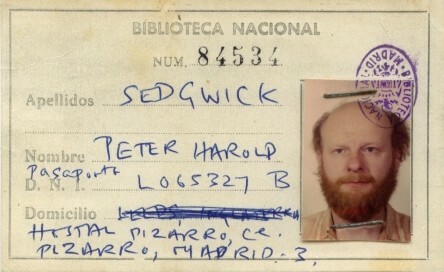 Probably along with that of Duncan Hallas, I miss the comradely humour and boundless humanism of Peter Sedgwick. In our present trials, in their quite distinctive ways, they still have much to tell us. Cant debate this now but just want to say that I didnt agree then, and still dont, with Peter Sedgwick’s attack on Laing, who was not a ‘fraud’, with a ‘mumbo-jumbo’ theory. I read and knew Laing and he did not say or believe that ‘the mentally ill were … really the only sane ones’. (John Palmer). This was a lazy media caricature. Thank you for your blog, which on this 30th anniversary of his death, is a wonderful tribute to Peter’s political life and published work. 1. I doubt that Peter taught himself French to translate Serge (Widgery’s account). My recollection is of Peter in our kitchen in 1970,listening to German lessons on the radio so that he could translate Brecht for a student production of Die Massnahme. 2.In regard to the last post, before he died Peter had met and had come to respect Laing.